TUALATIN — For the Tualatin High School football team, the first year with head coach Dan Lever, and his coaching staff, turned out to be pretty darn good. The second year looks to have the potential to be even better. The Timberwolves, who finished in fourth place in the final Three Rivers League standings at 4-3, while going 7-4 on the season and reaching the second round of the Class 6A state playoffs, are taking high hopes into the 2018 season. "In Year 2 of the program, we feel that, when it comes to semantics and continuity, we're way ahead of where we were last year," Lever said. "And, any time you have a returning quarterback, and the team speed to utilize, it's good. We're young up front, but these guys are putting the time in." 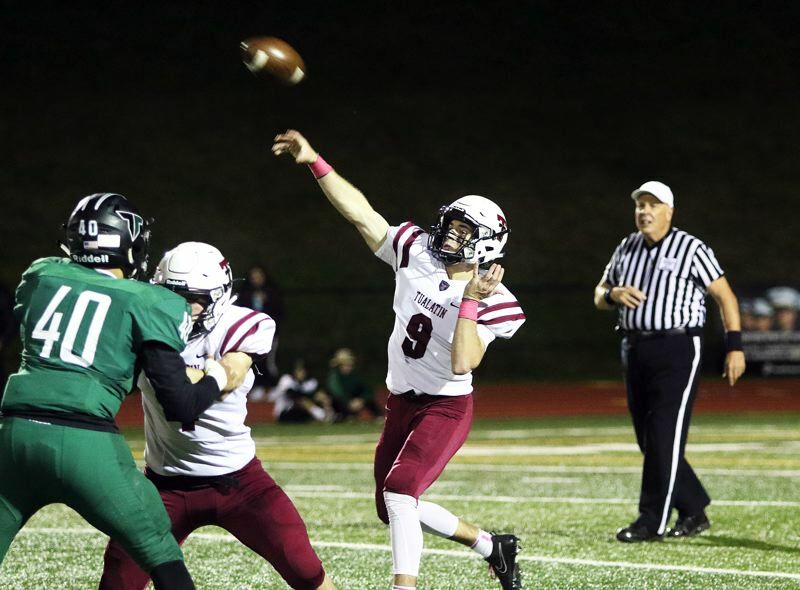 Leading the way for the Tualatin offense will be senior quarterback Kyle Dernedde (5-foot-11, 190 pounds), who is in his third year as the Wolves' starting quarterback. Last year, Dernedde was a second-team All-Three Rivers League selection at quarterback. "It's great to have him back," Lever said. "He's got a calmness about him this year, and he's a vocal leader." 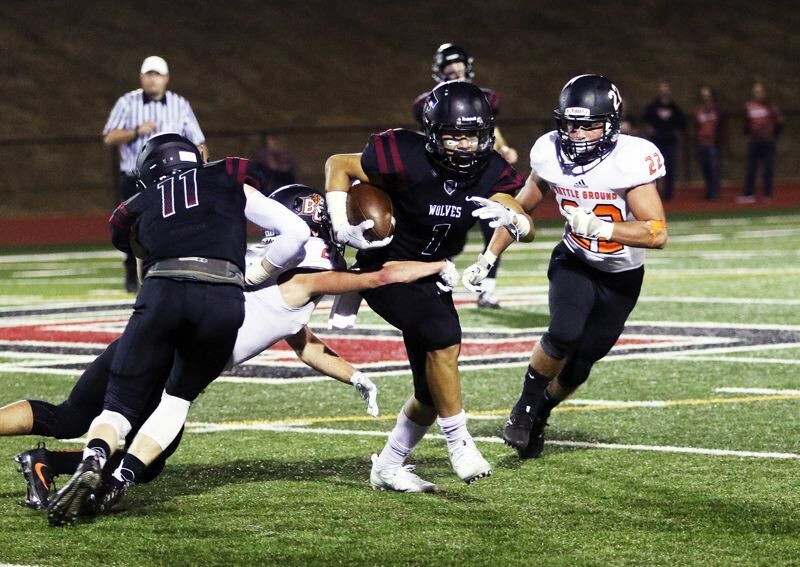 The Tualatin offense did take a hit in the offseason, as junior running back Kainoa Sayre, who was a first-team All-TRL pick last year as a sophomore, suffered a season-ending leg injury during the Linfield team camp this summer. "He's going to help us out with coaching this year," Lever said. "He's very invested in football, and we're looking forward to getting him back next year." Meanwhile, senior Dominque Loggins (6-0, 200) will help pick up the slack at running back. "He'll carry the load for us," Lever said. Senior Kyle Kamp (5-11, 190) and junior Josh Boespflug (5-10, 175) will also see action at running back. Junior Luke Marion (6-1, 175) will also play somewhere, and anywhere, in the backfield. "He's the best-kept secret in the TRL," Lever said. "He's going to explode for us. He'll surprise everyone." The Wolves are deep, and fast, at receiver. That group is led by senior Jett Searle (6-0, 190) and also includes senior Kwabena Lynn (6-0, 175), who won the TRL district track title in the 100-meter dash last spring, junior Cade McCarty (6-0, 180) and senior Caden Dickson (5-8, 175), who is returning to football after not playing the past two years. At tight end, the Wolves have junior John Miller (6-1, 205), who could also see action at receiver, and junior Jake Reser (6-1, 185). Tualatin does have some question marks in the offensive line. "The only guy that for sure has a starting role is (senior center) Dane Norlin (6-2, 250 and a first-team all-league selection last year)," Lever said. "It's a battle for the other spots. We encourage competition and we like to play a lot of players." Seniors Quinn McCarthy (6-5, 275) and Gavin Moore (6-1, 240) are among the other top candidates for the offensive line. "We've got great team speed on offense, and we're looking to utilize that," Lever said. The Tualatin defense may have a bit of a different look to it this year. 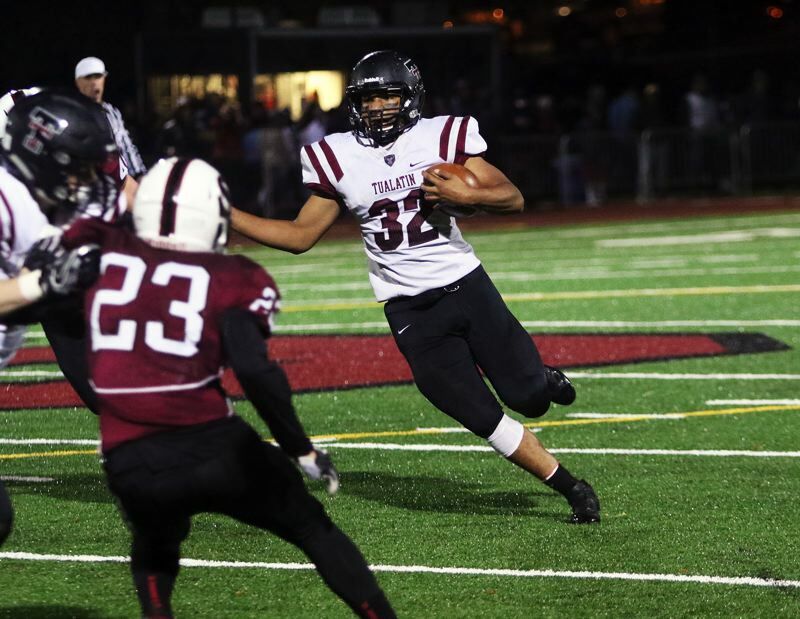 "We have to replace some good players," Tualatin defensive coordinator Erik Moen said. "But we have some young guys stepping up." The Tualatin linebackers may be the strong point of the team's defense, and that group is led by Miller, who was a first-team all-league pick at linebacker last year. Other linebackers include senior Garrett Boespflug (6-2, 180) and senior Jalen Hale (6-4, 180). Kamp will play at an outside linebacker/rover spot. The Wolves will have a brand new crew on the defensive line. A key could be Loggins at a defensive end spot. "He's a strong, fast kid," Moen said. In the defensive backfield, the Wolves will have Searle, Dickson, McCarty, sophomore Jake Alton (5-7, 160), senior Macquire Asay (5-8, 160) and Marion. "He's such a gifted athlete," Moen said. "We're going to be very athletic on defense, with a lot of team speed. We're just unproven." Dernedde and senior Andrew Malinowski (5-11, 175) will handle the kicking duties. Dernedde was a second-team All-TRL pick at kicker last year. "We're excited for the season," Lever said. "We're finally set to get after it." The Wolves will start their season on Aug. 31, when they host Southridge in a non-league game. Tualatin will also honor the late Ken Lester, who was a longtime freshman football coach in the Tigard-Tualatin School District. Former players are invited to meet in Room No. 128 at 5:30 p.m. prior to the game. Lester's wife will serve as an honorary team captain that night.